This is the second part of the series, where I chalk out some out-of-Dubai trips that don’t require any overnight stay. Just in case you have the last minute feeling of I wish I could go somewhere. None of them will leave behind holes in your pocket. The first part also notes down a few other great day trip ideas from Dubai. And if you are staying back in Dubai during the oncoming Eid Break, don’t forget to soak in what Dubai has to offer (no, not shopping malls please). Here’s my Connoisseur’s guide for that – Things to do in Dubai, like a tourist in my own city. Sun downer or a lunch/picnic at Al Maha Desert Resort and Spa: This is a tweaked (read inexpensive) way to peep into one of the most expensive resorts in the UAE. A private sanctuary located in 225 sq kms of the protected Dubai Desert Conservation Reserve, the Al Maha Desert Resort and Spa almost fits into the environment and is home to many species of animals, birds and flora and fauna. Celebrities choose Al Maha as their perfect hideaway as the resort maintains their privacy to the tee. A sundowner or a picnic for a group doesn’t require an overnight stay, yet gives you an exotic holiday feel without making a hole in your pocket. Once you park your car inside the resort, a Camel trek or the resort’s 4WD brings you to the sundowner in a secluded part in the middle of the Al Maha desert. From here, the main resort looks like a cluster of tents. A beautiful table arrangement awaits the guests – welcome drinks, chilled slices of fruits, fresh dates, nuts and of course Bubbly (costs extra of course). After the initial toasts and tastes and the sun goes down, a mini trek up and down the sand dunes takes you to the small camping site. This is where a magical menu created by Chef David Miras (@ChefDavidMiras on Twitter, this Chef loves to tweet as much as he likes to cook and stir!) awaits – Shrimp Ceviche marinated in a Sumak dressing, grilled Halloumi, devilled Prawns, Lamb Ragu with Parmesan shavings and many more. This is posh picnic under the stars, in the middle of the desert with fabulous food and ambiance. Another memorable experience of mine at Al Maha had been over a lunch that Chef David had organised – Twitterati Lunch at Al Maha. 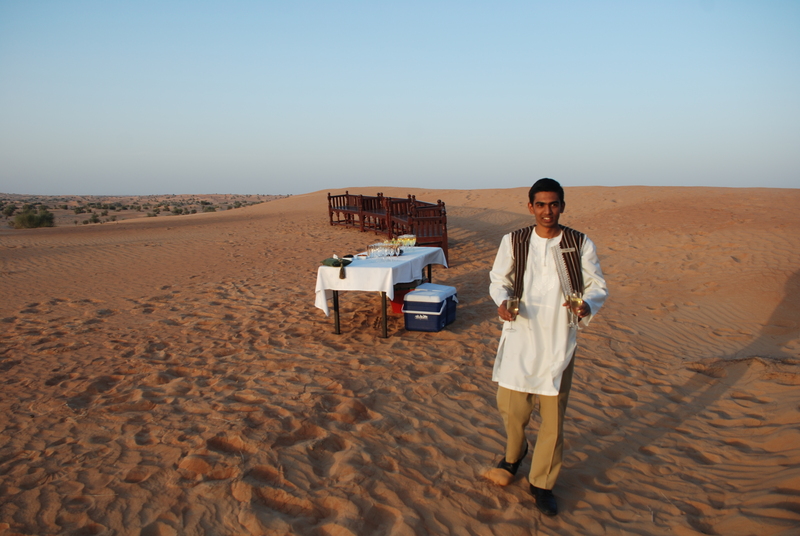 Cost: Dhs 200/person for a trek to sundowner by car or camel; Dhs 260 for Lunch and Dhs 490 for Picnic dinner. Various day trip packages are available too. Our sundowner picnic cost us Dhs 250 per person. More details here. Wisdom Note: ‘We are pleased to accommodate families; however, children under 10 years of age are not permitted in the resort’ – reads Al Maha Resort’s Child Policy. Unfortunate for some parents but the logic behind this is, the resort has been built in a conservation area and kids haven’t are not really known to be Oryx-friendly! Full Moon Desert Drumming with Dubai Drums: I’ve drummed with Dubai Drums at various locations and many a time. It all started with one session of drumming (careless and in complete abandonment) at the Z-Sister’s school. From reluctantly picking up the rhythm as shown by the leader (or the facilitator) to letting yourself completely in tandem with the rhythm – drumming is complete Nirvana. It is not about how perfectly you are playing the drums, but about surrendering yourself to the energy that has built up gradually, almost like a crescendo in an orchestral piece. I’ve drummed in doors, I’ve drummed out doors, at birthday parties but the best experience would be to drum in the desert on a full moon night. The next Full Moon drumming will take place on the 18th October, during the Eid holidays. Drumming with 200 odd people – adults and kids alike, in an open desert in Al Awir, on a full moon night – this is one incredible and unique experience for sure, to ‘connect with your inner rhythms’. All you need to is to just join in – be it the jamming or the tribal dancing. Fellow blogger Ginger and Scotch narrates her experience here. Cost: Dhs 220 for barbeque dinner and drumming (drum rental included). Special rates for kids. Meeting Point GPS: 25° 9′ 40.86″ N, 55° 33′ 50.31″ E (25.13135 N, 55.563975 E). More details on Full Moon Drumming here. Wisdom Note: With more than 100 drums vibrating all together, this is not really a low decibel affair. Hence, be prepared. It’s not noise but high octave energy vibrating throughout. The best part is that from kids to adults, everyone can join in. Dhow cruise in Musandam Dibba: The east coast of UAE is very different. The shoreline is rough with rugged mountains running parallel to the shore sometimes. Either you can drive to Dibba (it takes maximum of 1 hour if you take the new Dubai Fujeirah highway) or you can opt to be picked up from Dubai. The drive is beautiful once you reach Fujeirah – the view alternating between sandy shores and rocky hills looming above the sea like mastiffs. Traditional Omani Dhows or wooden boats await the tourist at the Musandam harbour. 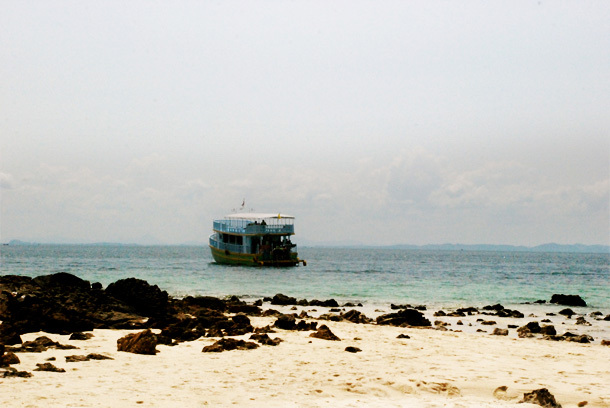 As the Dhow leaves the shores and sails the blue ocean waters, just pray that you see some dolphins. 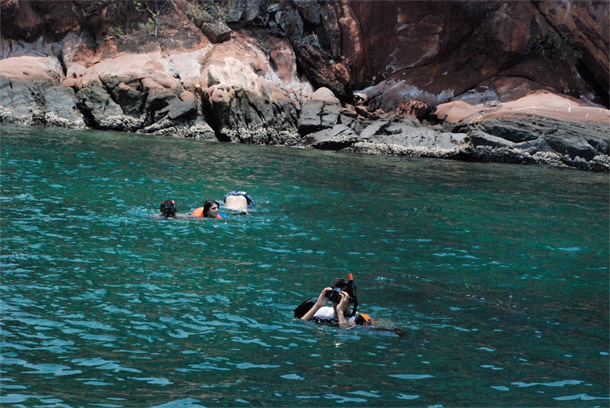 Here, the waters are perfect for snorkelling, scuba diving and deep sea fishing. So just jump off the Dhow and let multi-coloured shoals of fish guide your way! Cost: Dhs 350/- onwards, depending upon whether it’s a half-day Dhow cruise or a full-day Dhow cruise and the activities undertaken – snorkelling, scuba, deep sea fishing etc. More information here. Wisdom Note: Don’t forget to take your passport with you, because Musandam technically falls in Oman and there is a checkpoint at the UAE-Oman border, which might require you to show your resident permit. Clichéd, very very clichéd, but why not go for a Desert Safari? If you have just arrived in the UAE, you definitely must be having a fresh desert Safari Experience. But be honest, if you have been living here for long, then when was the last time that you went for a desert safari? I recently went to one, after many many years and I thoroughly enjoyed it. If the usual stuff like camel riding and sand boarding sounds clichéd, simple kick some sand, climb up the top of the sand dune, cup the sunset in your palm. Or be mersmerised by the Tanoura dance, an Egyptian folk dance performed in the Sufi dance style, where a Tanoura dancer (further below) may end up doing continuous whirling, almost up to 200 whirls! If the travel bug bites you at the last minute, and you want to get out of the country, you just might be able to do that, provided you choose a country with less visa formalities (a few travel posts of mine here… Srilanka, Thailand, Nepal). If you are staying back in Dubai, then here’s my guide on Things to do in Dubai. You may also want to discover old Dubai by embarking on an Arabian Pilgrimage Food Tour. For more eating, there’s the Connoisseur’s Guide To Eating Out In Dubai and the 7 Tastiest Fast Feasts Of Dubai. Enjoy your Eid Holidays! Disclaimer: Please note that this is not a sponsored blog and all the opinions and views stated here are my own and are independent. While you enjoy reading the posts with lot of visuals, please do not use any material from this post. The brilliant sand pictures during the desert safari, have been taken by our friend Pankaj who was visiting us. You can see more pictures of my travel and food journey here.